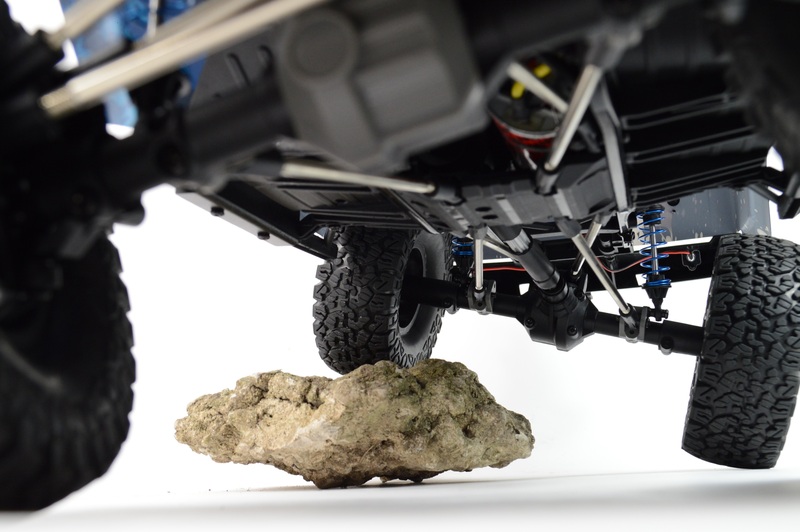 A hobby grade rock crawler from FS Racing. This fantastic looking model features a highly detailed jeep polycarbonate (PC) shell finished with replica mounted jerry can, little axe and shovel plus working LED lights. 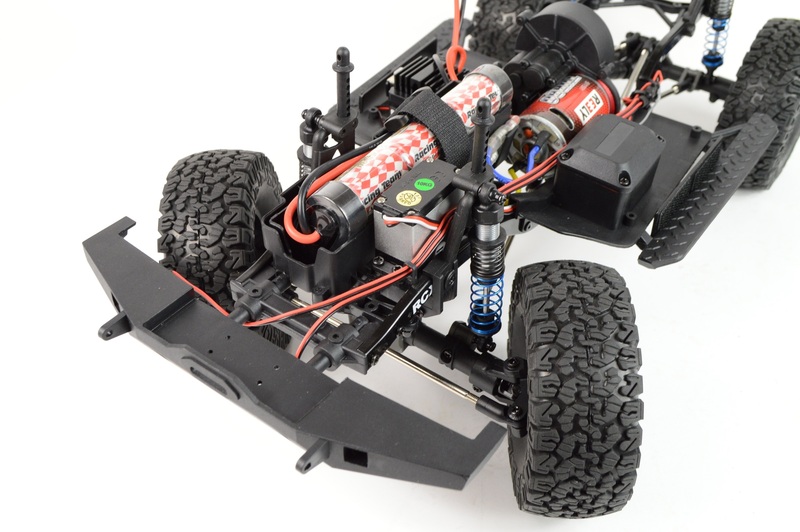 It is an advanced crawler with CNC main gear and main shaft, "C" channel chassis frame with cross braces, strong steel suspension and steering linkages and metal lockers in the front and rear differentials. The feature list goes on and on with waterproof electronics, bolt on link mounts for easy adjustments and 45 degrees of steering making this rock crawler a top of the range climbing beast. 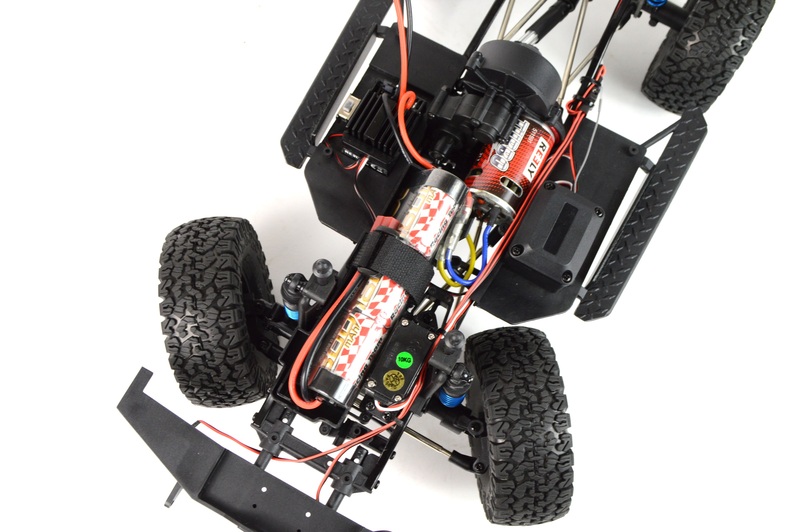 The rock crawler is powered by a 550 brushed motor and comes fully built complete with 2.4GHz radio system and rechargeable 7.2V battery pack with charger. With a model that looks like this you are going to want to hit the off road pretty hard so with that in mind all the electronics have been upgraded to waterproof and dust proof versions and the differentials are impact resistant. This is a precision manufactured high quality model with a massive feature list, check out the full list below. This model has a 4 Wheel Drive system with CNC shafts and gear. 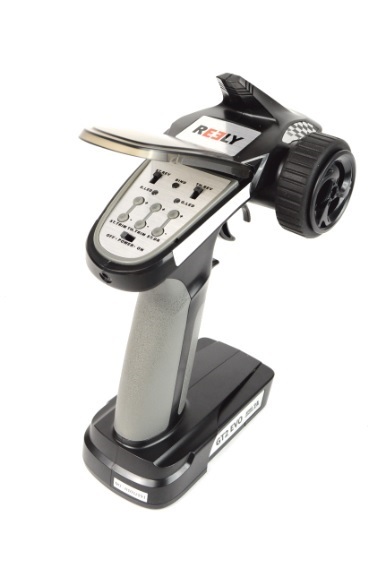 These hobby grade RC cars also feature working front and rear differentials that further improves handling. The 45 degree steering angle allows you to easily manoeuvre while rock climbing. Metal steering linkages for off-road durability. Full linkages and shafts on show while climbing. Chassis mounted 10kg ball raced servo & Velcro strapped battery. The compact centre transmission allows for a wide range of gearing choices. The overall ratio can be adjusted using different pinions allowing high speed or competition level crawling speed. Three gear layout with adjustable heavy duty slipper, dual slipper pads for more precise tuning and greater holding power. Metal motor plate with fully sealed gear cover. 3-piece front and rear prop shafts with aluminium spline slider and steel ends. The truck is fully ball-raced throughout. High input gears for added ground clearance & better drive shaft angles. Axle housings moulded in 1 piece for added strength. Metal diff lockers in front and rear. Bolt on link mounts for greater adjustability. Universal joint drive shafts allow up to 45 degrees of steering. Servo mounted on the chassis for scale looks. 4 link front and rear suspension with front pan-hard rod for nearly zero bump steer. Strong steel suspension and steering links with M4 rod ends. Oil filled aluminium shocks with threaded shock bodies are mounted with two stage springs giving a progressive spring rate. The realistic looking c-channel chassis frame is made from durable steel with cross braces to improve chassis rigidity. Realistic shock hoops with multiple shock mounting positions allows you to adjust your suspension for maximum performance. The open design makes maintenance quick and easy. The smooth centre skid plate reduces hang-ups on terrain. Chassis side plates hold the sliders and side body mounts while protecting the electrics. Additional holes have been added to the rear portion of the frame rails to allow wheelbase adjustments for alternative bodies. 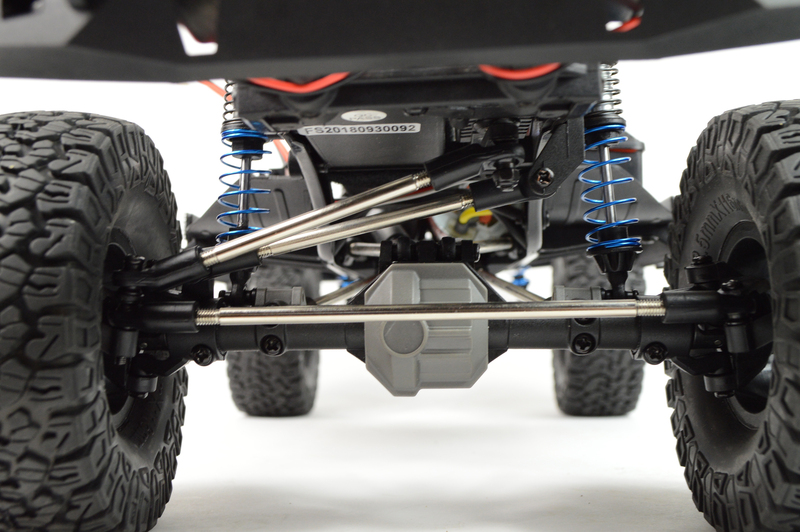 is located above the front axle, mounted low for better weight distribution. Easy access with Velcro strap fixing for quicker battery changes. Fitted with silicone gaskets for full waterproofing, no more stress when running in mud, water, or snow. Hobbywing waterproof crawler specific ESC included. 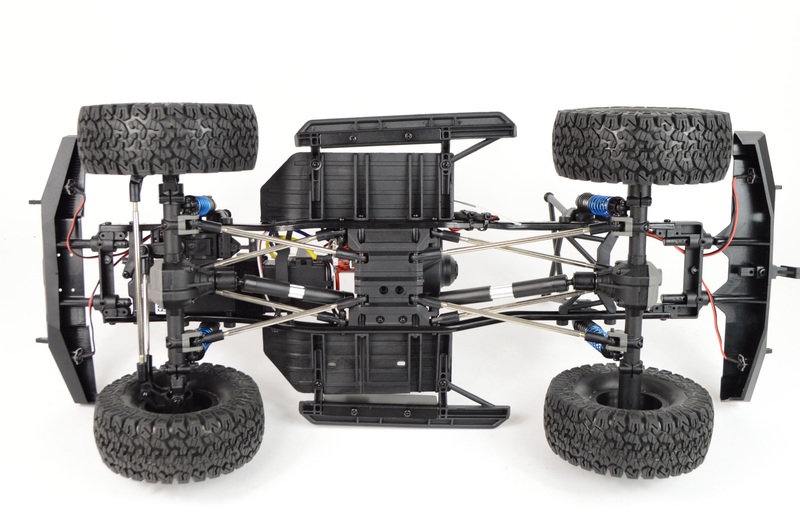 The receiver box and ESC are located on the chassis side plates for easy access. High torque servo with metal gears and dual ball bearings provide smooth and precise movement for the metal gear train. Wire routing clips throughout the chassis to keep your chassis layout looking clean. With moulded scale detail parts (mirrors, door handle, fuel can and tool rack.) Scale front and rear bumpers and rock sliders. Front bumper includes a winch mounting point that fits most common winches. Front and rear led lights mounted in the bumpers. Rear tow hitch included for added scale appearance.